I apologize to my small readership for my month-long absence from this blog. While there has been no shortage of cycling activities, the non-bikey part of my life (It’s true – I do have one!) has been occupying the greatest part of my attention for several months now. Still, I’ve still been gathering material for the blog all the while. 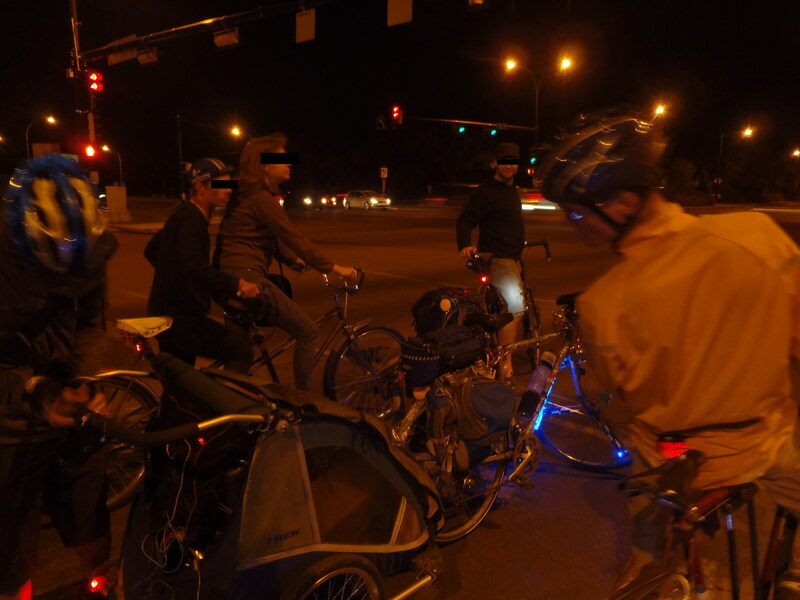 I have been working on a truly harrowing bit of investigative journalism, a descent into the murky world of Edmonton’s urban nighttime cyclists. 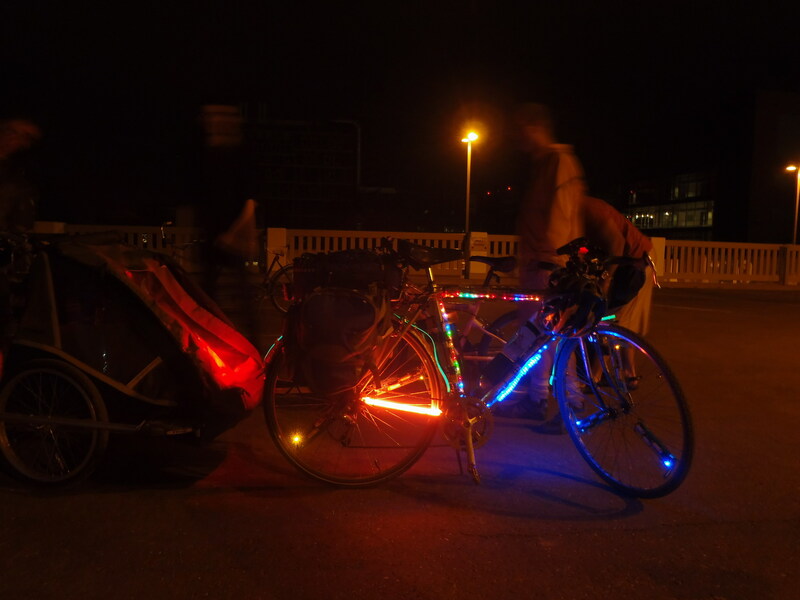 These enigmatic riders can be sometimes be spotted cruising the darkened city streets on a startling variety of light-bedecked bicycles, possibly with a music booming, laser light show beaming trailer in tow. Let me provide a necessarily incomplete glimpse into this shadowy society. Having had some slight contact with a group of nocturnal riders last summer, I began preparations for this investigation during the past winter. My first action was to purchase a set of Monkey Lights to install on my bike. Although moderately pricey, they seemed to be an effective way for me to blend in with the group. Next, I made discreet inquiries into ways of contacting the night riders to find out when the events might be happening. My efforts lead me to an obscure corner of the internet where some of these people gather. Having made contact I waited patiently for a ride to be announced. Near the end of May, I had my first opportunity. The trip departed from a certain south-side community bike shop. With a myriad of lights flashing, we glided down Whyte Ave, accompanied by music blasting from the trailer towed by one of the ride’s ringleaders. Passersby seemed bemused by our presence and many shouted or whistled calls of encouragement. It’s fun to make an electronic spectacle of yourself. Over the course of the night we bombed through a parkade (slaloming among concrete columns), cruised down the unlit river valley trails, and loitered about on the Fort Edmonton pedestrian bridge. There was worrying moment of excitement when two riders collided, sending both to the asphalt. One rider flew through the air, rolled, and came to his feet like an acrobat. Happily, neither cyclist was injured, although one front wheel was badly tacoed. 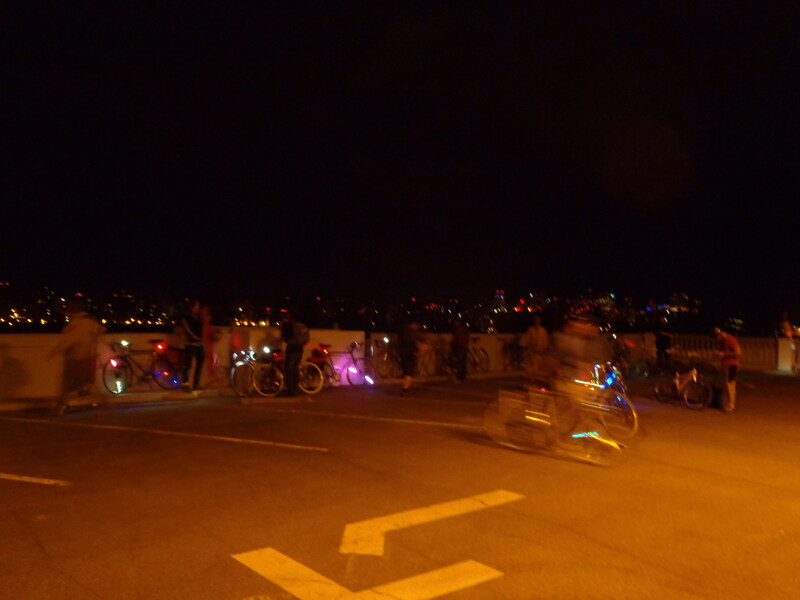 I also joined another ride last weekend, but was unable to photograpically document it due to a camera failure. Urban exploring was the order of the night, and several incomplete bits of the new LRT line were investigated. As the opportunity presents, I will continue to update this blog with the results of my continuing investigations into what one of my informants has referred to as “harmless badassery”. 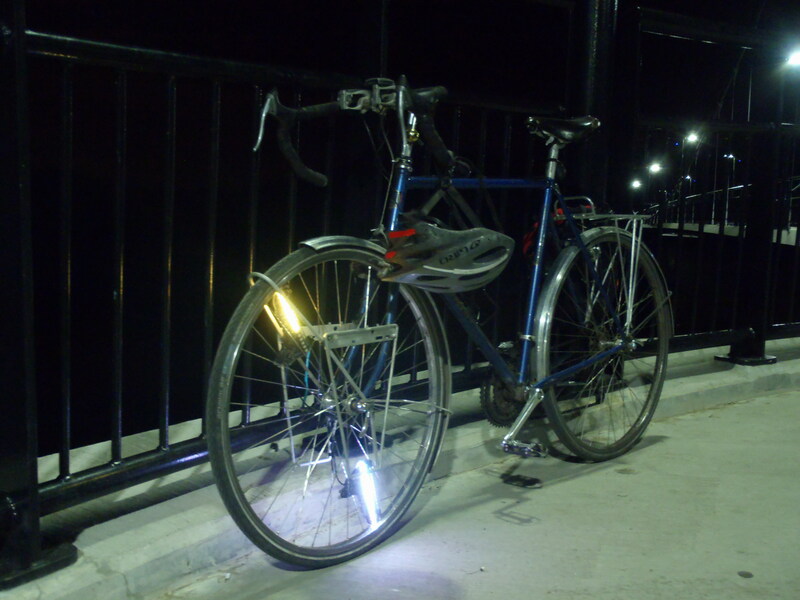 Again, The Fabulous Light Bike. 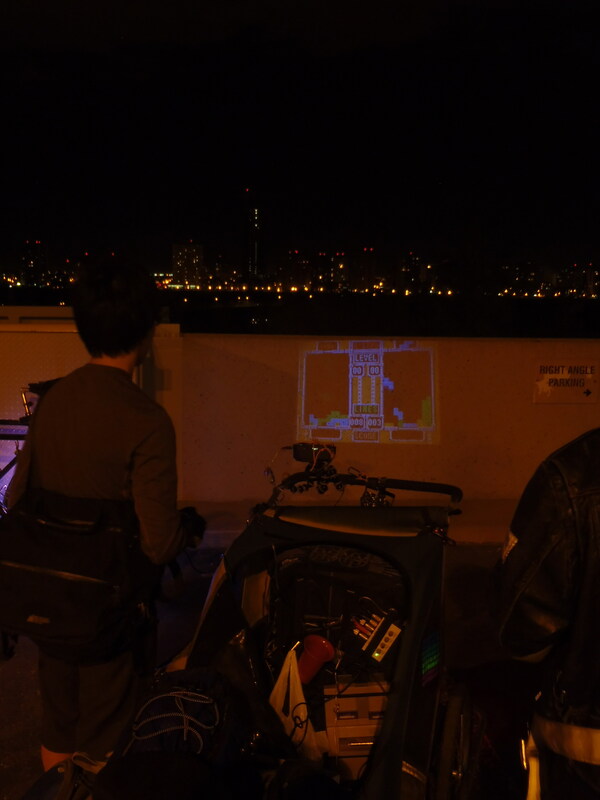 The Light Cyclist’s latest surprise from his trailer of wonders: a projector and Nintendo system beaming Tetris onto the parkade wall. I’ve concealed the identities of the riders.